Salivary gland - Vacuolation, Cytoplasmic in a female B6C3F1 mouse from a chronic study. 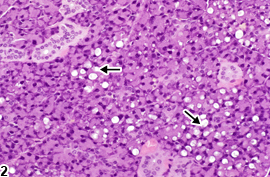 There are small, clear spaces (vacuoles) in the cytoplasm of the acinar cells (arrows). 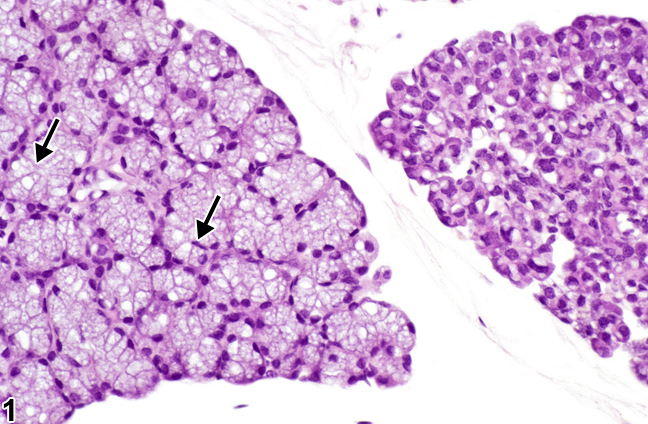 Salivary gland - Vacuolation, Cytoplasmic in a male B6C3F1 mouse from a chronic study. 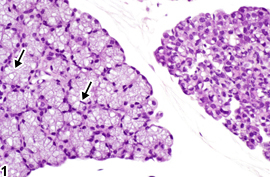 There are small, clear spaces (vacuoles) in the cytoplasm of the acinar cells (arrows). Cytoplasmic vacuolation is generally considered to be an early form of degeneration. Cytoplasmic vacuolization ( Figure 1 and Figure 2 ) manifests as increased cell size and volume resulting from an overload of fluid caused by a failure of the cell to maintain normal homeostasis and regulate the ingress and excretion of fluid. Histologically, cells are enlarged and the cytoplasm of affected cells contains translucent vacuoles. The vacuoles may represent distended endoplasmic reticulum or Golgi or swollen mitochondria, indicative of cell injury. In some cases, the vacuoles may represent small lipid droplets. Electron microscopy is required to definitively identify the true nature of the vacuoles. Whenever present, cytoplasmic vacuolation should be diagnosed and graded based on the number and size of vacuoles. 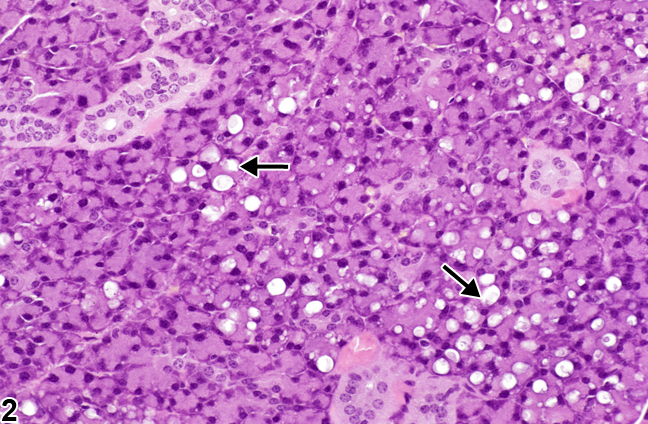 The term "degeneration" can be used if there is evidence of cell damage beyond cytoplasmic vacuolation but no significant necrosis. If inflammation is a prominent component of the lesion, it should be diagnosed and graded separately. Hargis AM, Ginn PE. 2007. The integument In: Pathologic Basis of Veterinary Disease, 4th ed (McGavin MD, Zachary JF, eds). Mosby, St Louis, MO, 1107-1261. Myers RK, McGavin MD. 2007. Cellular and tissue responses to injury. In: Pathologic Basis of Veterinary Disease, 4th ed (McGavin MD, Zachary JF, eds). Mosby, St Louis, MO, 14-62.